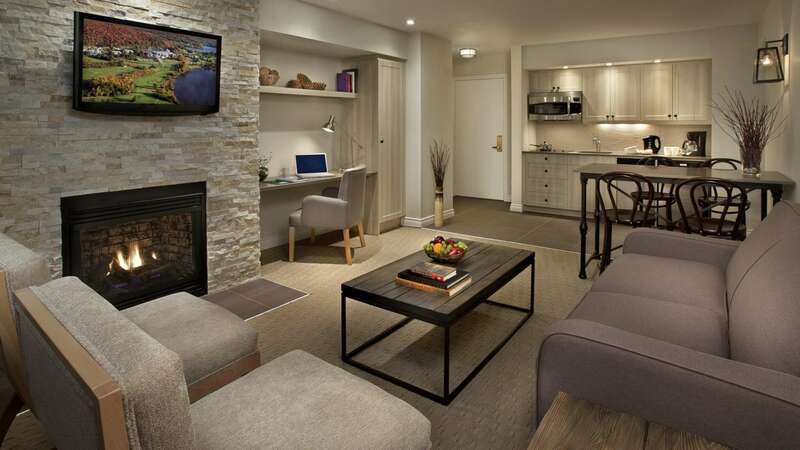 Deerhurst Resort’s vacation rental condos and suites are located in a variety of condo enclaves nestled throughout the scenic Muskoka landscape. Kitchen: Dishes, cookware, cutlery, dish cloth, pot scrubber and dish towels, dish detergent, garbage bags, coffee, coffee machine and filters, kettle and microwave. Bathroom(s): Range of toiletries, toilet paper, tissues, and clean towels to accommodate the maximum number of guests for your unit. Garbage disposal bins are conveniently located outside your building if needed. Should your stay exceed three nights, a Towel and Amenity Refresh Service will be provided complimentary on the 4th day of your stay. This service consists of fresh towel supply, restocked amenities and trash removal. Stays of more than 7 nights will receive full cleaning services on the 8th day of stay, which includes restocking of amenities, trash removal, change of linens and towels, and vacuuming. We hope you enjoy your home-away-from-home vacation rental stay at Deerhurst Resort and we look forward to welcoming you to Muskoka! *Not applicable for contracted group bookings.